Tonbridge is a large market and commuter town set on Kent’s river Medway, and in the shadow of Tonbridge Castle which dates back to 11th Century. The town is also surrounded by vast areas of open countryside and smaller rural villages including Hildenborough, Leigh, Penshurst and Hadlow, whilst also providing excellent transport links to London and the South Coast. These include the mainline rail link to London Charing Cross, Ashford and Hastings. The town is also in close proximity to the A21 Tonbridge Bypass which leads North onto the M25 and South to the Kent Coast, and the A26 leads out from the town itself towards Maidstone and junctions with the M2 and M20. Tonbridge offers a wide range of excellent primary and secondary schools, both state and independent and a busy high street which provides a variety of shopping facilities, cafes, restaurants and bars as well as a many other local amenities. 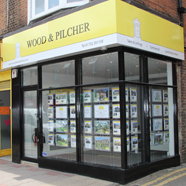 Wood & Pilcher’s newest office is located in a prime location along the high street and is the first of the Tonbridge agents to venture into the busier south end of the street.